The ideal temperature and air quality for each season The Daikin floor standing unit for home use has a contemporary design, extremely quiet in operation, energyefficient and creates a very comfortable climate in the living room, kitchen or bedroom - day and night, the whole year round. The indoor unit can be used in pair application, combining one indoor unit to one outdoor unit, or multi application, combining up to nine indoor units to one outdoor unit. Whisper quiet operation: the sound of the indoor units is that low (down to 23dBA) that it can be compared to rustling leaves. In night quiet mode, the sound level of the multi model outdoor unit is automatically reduced by 3dBA (only for cooling only mode). 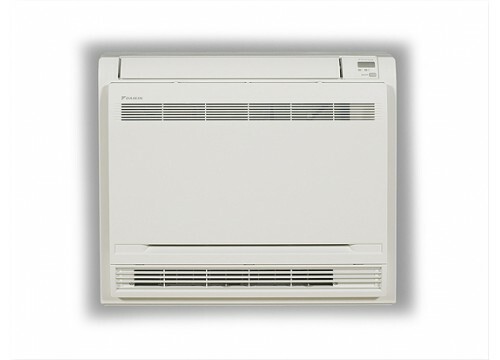 The vertical auto swing system provides consistent air and temperature distribution in the room. During heating operation, your feet stay warm and the temperature throughout the room is even. Dust, odours are trapped by the titanium apatite photocatalytic air purification filter but also bacteria and viruses are decomposed in order to provide you a cleaner air. The infrared remote control is user-friendly and equipped with a weekly timer. With this timer, you can programme a 7-day schedule with 4 different actions per day. Furthermore, the convenient copy function allows you to copy very quickly any day’s programme to one or more other days. When powerful operation is enabled, you can rapidly heat up or cool down the room during 20 minutes. After this the unit returns to its original setting.